I was listening to Chef Kylie Kwong on the radio yesterday, talking about food and her memories of it. She said that if we eat good quality food, we think good quality thoughts. And if we think good quality thoughts, we become good quality people; with our thoughts we change the world. It’s amazing that we can have such an effect upon our world simply from feeding ourselves well don’t you think? I find food very interesting. When I was a child, it was one of my mother’s greatest priorities to feed us well; she believed that a healthy body and a healthy mind would be very useful to us as we grew up. Smart woman. 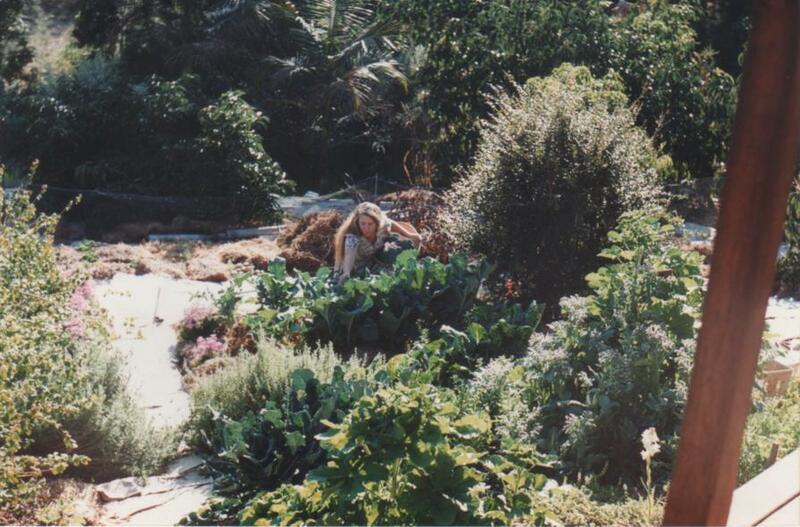 We were vegetarian for 10 years or so, macrobiotic for a while and just about everything we ate was grown in the garden or made by hand. 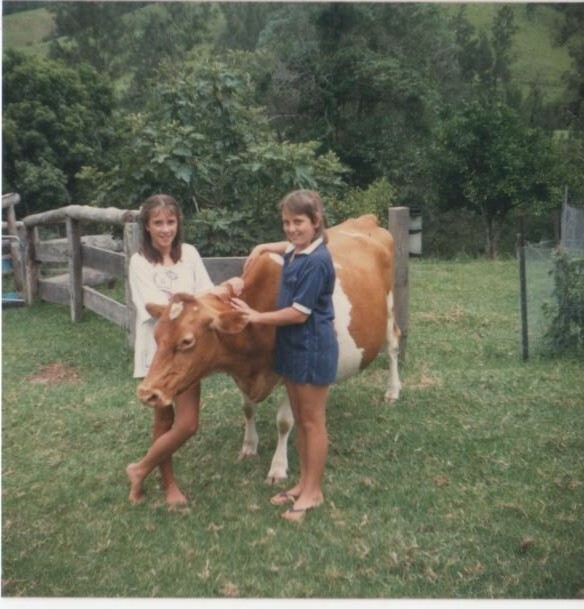 We milked a cow for a few years (our beloved Guernsey cow) from which mum made yogurt and cheese. We grew soybeans in the bottom paddock (by ‘we’ I don’t mean me) from which mum made tofu and okara. We had a huge vegetable garden that we ate out of all year round and an orchard with avocadoes, figs, stone fruit, citrus, pawpaws, jaboticabas, brazilian cherries, cherry guavas and more. My mother harvesting vegies from the garden. When we did start eating meat, we ate beef from the cows we grew on our certified organic farm. It’s interesting how your childhood goes on to inform your life as an adult. I like to make my food from scratch with ingredients that are real. I like to eat produce from my local area, I like to eat it fresh and in the season it naturally grows in. I am fussy about the oils I eat – I like butter, coconut oil, olive oil and macadamia oil. I like to make ethical choices with my food purchases and to support farmers that look after their land and their animals. I like full cream milk, fresh eggs from our chickens and ducks, spicy chai made from scratch on a cold morning and proper sourdough bread. However, I’m not much of a gardener, and I don’t live on a farm. I don’t like diets or eating regimes and I don’t like being told what to eat by people who have found a way of eating that suits them and who then try to make it suit everyone else. Have you noticed how food has become like a religion? No meat, no wheat, no gluten, no grains, no dairy, no salicylates, no animal products, no sugar. Raw food, Jesus food, cave man food, blood group food. My diet is better than your diet – if you don’t eat my diet, you will surely go to hell (the hell of fatness and disease). I choose to not participate in this food world. I choose to not rely on what works for other people to make choices for myself. I choose to listen to my body and eat food that I like and that makes me happy. So how do you know what food is good for you? Pay attention. Pay attention to what you eat, and how you feel after you eat it. If your body does not like what you have just fed it, it will tell you. It will tell you quietly and politely at first and progress to louder, (c)ruder communication if you ignore it. Stop eating that food for a while. Today I ate lunch out, and finished it off with a zabaglione gelato. God it was good. My body didn’t agree and told me so by giving me pains in the stomach and diarrhoea for a few hours. I know that sometimes my body doesn’t like dairy very much, and it needs a rest from it. So I won’t have dairy for a while, a couple of months maybe, and then I’ll try some and see what my body thinks. We can get so distracted, can’t we, from what’s important; real food, fresh food, nourishing food. Food that is prepared with love and eaten mindfully. It’s so simple, really. Great post, Sara! I grew up in the country as well and was eating organic before everyone called it that. You are so right about your own body tells you what you should and shouldn’t eat. Love the pics — and the post, so spot on. :). Thanks Brigitte. I had a privileged childhood for sure, although I don’t know that I appreciated it at the time (well, who does?). I was pretty happy the photos worked – I knew which ones I wanted as soon as I started writing 🙂 Have a great day. I’d also add that eating food without slathering some sort of sauce or covering it with cheese also keeps it real– because we’re tasting what the food is actually supposed to taste like. Great post! Homemade sauce and good quality cheese has its place…but I know exactly what you mean!